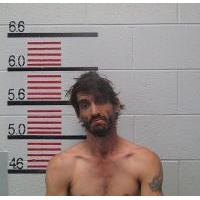 Oneida, TN (2018-09-10) An Oneida man that was once accused of trying to cut down a door with a chainsaw to get to his alleged victim has been arrested for a third time for domestic assault. Harry G. Dilts, Jr., 38, of Oneida was booked into the Scott County Jail last week following an alleged domestic dispute at an Oneida residence. According to an arrest warrant written by Agent Bill Miller, Dilts allegedly hit his victim in the face and then attempted to suffocate her by putting a plastic bag over her head. Authorities say the victim’s juvenile son attempted to break up the scuffle by hitting Dilts on the back. Last year, Dilts was accused of using a chainsaw to cut open a door inside his home to gain entry into a room where his wife had sought refuge following a domestic dispute between the couple. He was arrested again in January for allegedly strangling his wife. Dilts was charged with domestic assault.